Tags let you merge ad groups within a campaign, making it quicker to search for and edit ads. You can view all your ad groups that have with the same tag label at once and perform group actions with them. Using tags, you can merge ad groups by product category, brand, and product cost. You can also use the Report wizard to filter statistics. 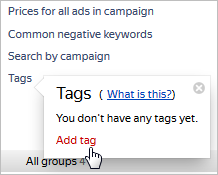 To create tags on a campaign page, go to Tags → Add tag. In the window that opens, enter words and phrases separated by commas. The maximum tag length is 25 characters including all symbols other than commas. You can create up to 200 tags in a campaign. Assign tags to ad groups. Click and select tags from the list. Or select the appropriate groups and select Attach tags in the Action field. Then click Apply. You can enter up to 30 tags for ad groups. You can rename tags, delete existing tags, or create new ones. Just click Tags → Edit tags. You can hide the Tags section on the User settings page by disabling the Show tags option. To filter by ad group, click Tags and either enter the name of a tag or click Show ads without tags. In the Report Wizard, use tags to filter and analyze an ad campaign. For example, let's say you merged ad groups using brand tags. When you put together your report, filter by the “Tag” with the value you need. The report will only contain data for the brands you select.